The BLACK SOAP, "beldi" in Arab, it is a 100% natural exfoliating soap, rich in E vitamin. This paste from the dark color, based on black olives oil, purifies the epidermis eliminating the dead cells. The gommage with the black soap and the KESSA (the fabric glove) is one of the principal rites of the hammam. Black soap prepares skin to the gommage lifting the dead cells of the epidermis. For a complete Purifying-Revitaizing-Antiage action, as it happens in the hammams, after the gommage apply the body Argan oil Les Arganiers. For the application, take a warm bath or shower to facilitate the opening of the skin pores and to allow an effective penetration of the product. Soap the body and leave it acting for 5 minutes. 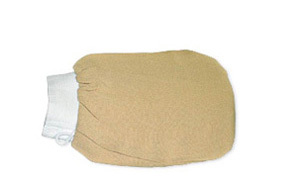 Exfoliare it with kessa glove with circular movements on the whole body. Rinse with warm water and gently dry. 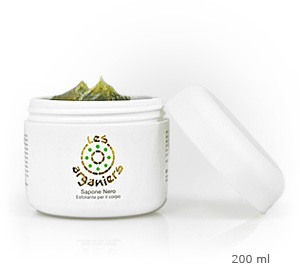 Results: PURIFIED, SMOOTH and SOFT skin. Type of Skin: for all the types of skin, recommended for DRY SKINS. In the HAMMAM treatment it is used before the ARGAN OIL BODY massage.